Chronic inflammatory demyelinating polyneuropathy (CIDP) is a progressive autoimmune disease that destroys the myelin sheaths of peripheral nerves. Individuals with this nervous system disorder tend to present physically with symmetrical weakness, balance problems, impaired sensation and diminished reflexes in addition to problems at a neurological level. The long term nature of this condition leads to abnormalities in gait and impairments in both psychological and social functioning . The human nervous system can be divided into 2 parts. The central nervous system, which includes the brain and spinal cord, and the peripheral nervous system, which contains all nerves that supply the rest of the body. Surrounding the peripheral nerves is a white, fatty layer of myelin that is made up of glial cells, termed Scwhann cells. 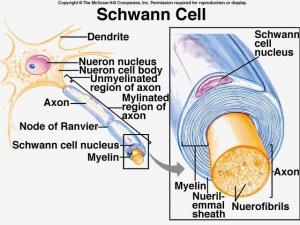 The myelin coating generated by the Schwann cells assists the axons in transmitting faster neural impulses to receptor sites, such as organs and muscles. 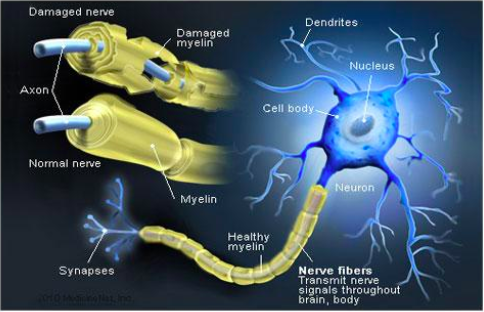 In CIDP this myelin is destroyed resulting in nerve conduction changes and impairments, such as limb weakness and sensory loss. CIDP can be distinguished into two categories; typical and atypical cases. Symmetric motor/sensory impairments with proximal and distal weakness and areflexia, slowed conduction rate, temporal dispersion, and/or a conduction block occurs in typical cases of CIDP. Atypical cases can present in a number of different ways. Most commonly atypical cases are purely sensory or predominantly sensory, multifocal with persistent conduction block, and cases that present with similar and bilateral distal symptoms. Pathological changes have been seen to be more pronounced in the spinal nerve roots, major plexuses, and proximal nerve trunks. Magnetic resonance imaging (MRI) studies following patients for an extended period of time have concluded that nerve hypertrophy and/or *gadolinium enhancement are more prominent in these areas. *Gadolinium: Is commonly used in MRI studies as the primary contrast media. When looking at the immunopathology of CIDP the two important cells to analyze are T and B lymphocytes. They both play a primary role along with macrophage cells in myelin phagocytosis as seen within nerve lesions of CIDP. Additionally, T cells play an important role in the increased permeability of the blood nerve barrier as seen on MRI studies of inflammatory neuropathies. A high percentage of patients with CIDP have been shown to have positive outcomes to plasma exchange therapy. 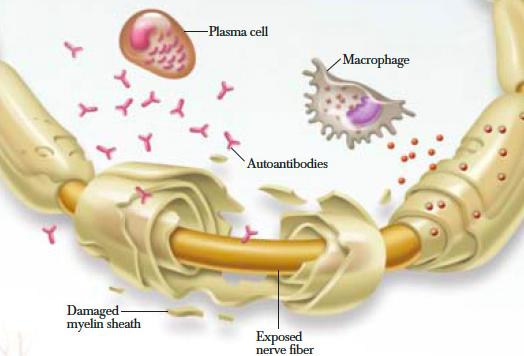 This suggest that the antibody or other soluble factors are pathogenic in this disease. Incidence: CIDP is suspected to be vastly underestimated, in part due to underreporting, uncertainty in making the diagnosis and diagnostic criteria inconsistencies . Many research studies report different distributions of cases with diagnostic numbers as low as 0.5 per 100,000 children and 1 to 2 per 100,000 adults to as high as 7.7 per 100,000. Individuals often report difficulty with walking, climbing stairs, balance and manual dexterity, which is attributed to the progressive, symmetric limb weakness and sensory loss. 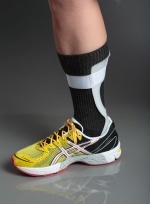 It is commonly seen to affect proximal muscles in the early stages and then progressively move to the distal limbs. Numbing, buzzing and tingling may be characteristic of sensory loss reported by patients and neuropathic pain is less often reported. On the contrary, some individuals may not present with these symptoms, which makes diagnosis much more difficult and can take many years, leaving patients with no answers and increased frustration. Global muscle weakness of the upper and lower extremities, the reduction of deep tendon reflexes and aggressive course of the disease are distinguishing factors between CIDP and chronic length-dependent peripheral neuropathies. The demyelinating form of Guillain-Barre syndrome (GBS), which is a form of acute inflammatory demyelinating polyneuropathy (AIDP), and CIDP are quite similar in nature and are differentiated by their time of progression. GBS often occurs after an identifiable infectious illness, vaccination or surgery, 3-4 weeks prior to the onset of symptoms. In comparison, CIDP often does not have an easily identifiable antecedent event and progresses for 8 weeks or more..
As stated previously, CIDP is suspected to be vastly underestimated. On the contrary, there is research suggesting that a misdiagnosis of CIDP commonly occurs in other neurologic conditions. 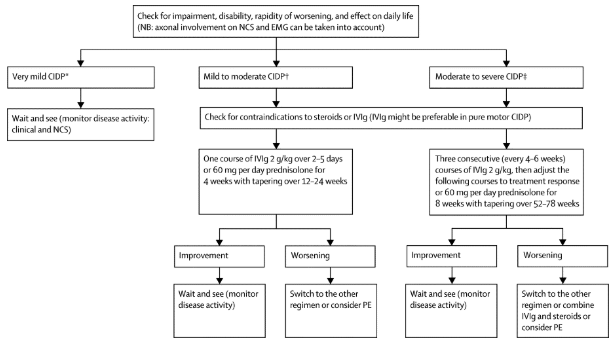 This misdiagnosis is attributed to the lack of implementation of specific clinically relevant criteria and electrodiagnostic criteria. One study even determined that a whopping, “Forty-seven percent of patients referred with a diagnosis of CIDP failed to meet minimal CIDP diagnostic requirements” . The amount of underreporting and misdiagnoses demonstrates the importance of implementing the most current and valid diagnostic criteria. Since the pathological changes in polyradiculoneuropathies such as CIDP or GBS involve proximal regions mainly, these regions need to be examined electrophysiolgoically by testing F waves. The purpose is to look for a proximal conduction block or for recording evoked potentials, however, routine studies may sometimes be normal. It has also been noted that motor fibres tend to be more affected compared to sensory nerves and this is taken into consideration during the diagnosis stage. Another diagnosing feature of CIDP is that it tends to affect more of the proximal muscles first, typically causing torso weakness in early stages . According to the American Academy of Neurology in order to have a definitive diagnosis both a cerebrospinal fluid sample must be taken, as well as a nerve biopsy. However, there is a current controversy regarding the need for the biopsy to be performed in order to be included in the diagnosis (Lewis, 2007). Other possible ways to confirm or reject a diagnose include: lab studies based on serum glucose, glycated hemoglobin, thyroid function studies, hepatitis profiles, HIV testing and serum immunofixation electrophoresis. Most therapies used to treat CIDP aim to block immune processes in order to stop inflammation and demyelination, in addition to preventing secondary axonal degeneration. Patients who respond to treatment must continue until their condition is stabilized or maximum improvement occurs. Improvements are measured with comparable signs such as improvement in sensation, strength and the performance of activities of daily living (ADL’s). Further treatment/maintenance therapy is provided to assist the individual with the intention to reduce the frequency of relapses and slow disease progression. Patients should be aware that infections, systemic conditions and neurotoxic drugs can negatively influence the symptoms of CIDP. Additionally, treatments also aim to reduce patient symptoms, such as weakness and pain, and improve overall functional status. Occupational therapists can prescribe gait aids, specialized tools and ankle foot orthotics, if necessary, to assist individuals with functional tools for ADL’s and ambulation. Psychologists may also be an important part of the interprofessional team as they can address symptoms that often accompany a diagnosis of a chronic disease and change in functional status, such as depression, anxiety or frustration. Research by Koller et al.,2005 it suggests that 60 to 80 percent of patients that are treated with intravenous immunoglobulin, corticosteroids or plasma exchange have improvements in their condition, but the long-term prognosis varies according to when the therapy is initiated and the degree of associated axonal loss. A physiotherapist's role in the treatment of CIDP needs to be very specialized to each individual. Physiotherapists prescribe gait aids that may assist with balance and ambulation during ADL’s. Manual therapy may also be provided when indicated to prevent joint contractures and maintain available ROM. Since many individuals with CIDP have difficulty with balance and walking, gait retraining and exercise programs prove to be beneficial at increasing efficiency and endurance. Exercises that promote muscle strengthening and aerobic conditioning are important once patients have received clearance from a physician for an exercise program. Exercise parameters for CIDP patients also need to be individually tailored as it is important that individuals don’t over exert themselves. As a result of the demyelination of axons the body is unable to recruit as many muscle fibres to complete a task, which may cause the muscle fibres that are engaged to be overworked. Some delayed onset muscle soreness is expected to occur, but pain that persists longer than 12-48 hours, with or without a loss of strength, is an indication that the F.I.T.T. parameters need to be adjusted because the patient was overexerted. It also crucial to assess that CIDP patients can complete a motion against gravity before apply external resistance to the movement, as it is important to have baseline muscle control before progressing exercises. Recent studies on the effects of exercise programs for patients with CIDP have provided good insight and direction for future physiotherapy treatments. Janssen et al, (2018) completed an intervention that was designed around the Otago Home Exercise programme. 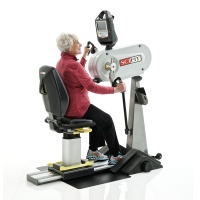 This protocol targeted falls prevention, lower limb and core strength exercises with dynamic balance retraining. Their goal was to maximize walking and functional movements required for maintenance and recovery. Patients were prescribed an individualized exercise plan to do three times as well as 30 minute walks twice weekly for a total of 6 weeks. The physiotherapist was able to check in with participants during the 6 weeks. The results demonstrated that a tailored exercise program had a positive effect on participant’s walking speed and balance in patients with CIDP. More studies will be need to be completed to determine the long term impact, however these are very positive results and should be taken into account when treating a patient with CIDP. Markvandsen et al, (2017) examined the effects of a 12 week aerobic or resistance exercise training programs. The aerobic exercise program involved patients on an ergometer bicycle at home or at a local fitness center for 20-30 minutes 3 times a week. The resistance program, which trained the knee and elbow flexors/extensors on the patient’s weaker side, was completed 3 times a week under the supervision of the authors and each exercise was done repeated 12 times in sets of 3. During the aerobic training period, VO2 max, 6MWT scores and muscle strength increased. Resistance training also resulted in an increase in muscle strength on the trained, initially weaker, side. The results from this study demonstrate that physical exercise training in patients with CIDP is feasible and effective. Their research determined there was no change in disability, quality of life fatigue severity. The authors hypothesised the lack of change in quality of life was due to the difficulty of 3 times a week exercise and exhaustion following exercise. This must be considered when designing an exercise program for someone with CIDP. The prognosis for CIDP is highly dependent on age at onset, clinical form of the disease, and initial response to treatment. Although not yet validated, it is suggested that increased time between the onset of symptoms and beginning of treatment will result in poor prognosis. For two thirds of people diagnosed, their disease is progressive while the remaining one third have relapsing episodes. The prognosis is good for patients with monophasic or relapsing course of CIDP, and younger patients with rapid onset or a monophasic course are more likely to respond to treatment. Long term remissions after treatment is less frequent in the elderly population compared to juvenile patients or adults aged younger than 64 years. Overall neuropathy limitations scale (ONLS) → Modified ODSS; ODSS item “Does the patient have difficulty walking?” was changed to “Does the patient have difficulty walking, running or climbing stairs?” The remaining scoring criteria are not different from the ODSS. ↑ 2.0 2.1 2.2 2.3 2.4 Latov N. Diagnosis of CIDP. Neurology. 2002;59(6):S2-S6. 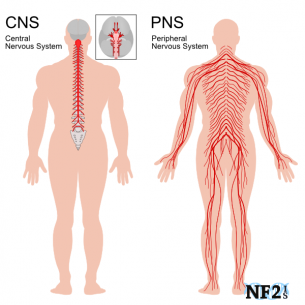 ↑ CNS and PNS Explanation. (2018). [image] Available at: https://www.nf2is.org/peripheral_nerve_damage.php [Accessed 7 May 2018]. ↑ Purpose of Schwann Cells. (2018). [image] Available at: https://socratic.org/questions/in-human-anatomy-what-is-the-purpose-of-the-schwann-cells [Accessed 7 May 2018]. ↑ 8.0 8.1 8.2 8.3 8.4 8.5 8.6 8.7 8.8 Lewis R. Chronic Inflammatory Demyelinating Polyneuropathy. Neurol Clin. 2007;25(1):71-87. doi:10.1016/j.ncl.2006.11.003. ↑ 14.0 14.1 Wolfe, G. and Greer, M. (2015). Diagnosing and Treating CIDP - GBS/CIDP Foundation International. [online] GBS/CIDP Foundation International. Available at: https://www.gbs-cidp.org/ecomm/diagnosing-and-treating-cidp/ [Accessed 7 May 2018].